I am all about quick and easy meals. Sometimes I have a lot of time to make an elegant meal. Sometimes I don't want to spend more than 30 seconds making a meal. It is all very relative to how I'm feeling that day. This recipe isn't just quick and easy, but it also tastes delicious! I have always loved french toast, so making simpler is even better! Prepare 1 large mug, or 2 smaller mugs by greasing them with butter. You can do this with the butter cold and rubbing it on the sides, or melt the butter and slosh it around in the cut to get the sides. Cube the bread. They don't have to be perfect. Place bread in prepared cups. Press down slightly on bread to squish it into the cups. In a separate cup or ramekin combine egg, vanilla, cinnamon, milk, salt, and syrup. Mix with a fork. Pour egg mixture over bread pressing down slightly as you go to make sure all the peices are getting a little of the egg mixture. Let bread rest for a minute to absorb the extra fluid. Place in a microwave for 1 minute. If liquid still remains in cup after the 1 minute return to microwave and cook at 10 second intervals until it is all cooked and there is no runny egg left. Let cool briefly and then top with more maple syrup and enjoy! This is one of those life saver recipes for when your in a rush to get the kiddo's fed before school. I'll be bookmarking. Thanks for sharing! This is a great idea! I am going to try it tomorrow! Thanks for sharing! I'm a total french toast fiend! Now I can make them without all of the extra work. :) Thanks for sharing. 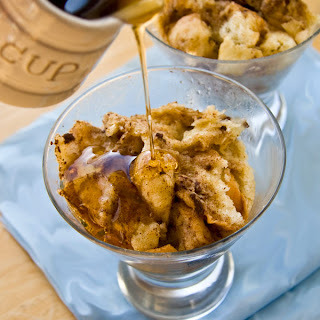 I love this, I have some leftover french bread that I've been wondering what to do with!